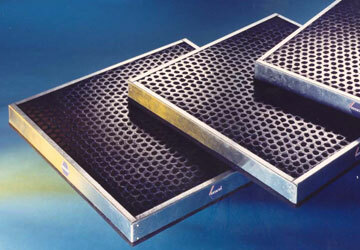 The Emcel Divided Bed Activated Carbon Filter is designed to provide high performance adsorption of toxic contaminants. The filter incorporates deep bed carbon cells manufactured to the same unique patented design construction as EMCEL standard activated carbon filters. The tortuous path followed by the contaminated air through the individual cells, ensures toxic removal efficiency significantly higher than is provided by standard activated carbon filters. EMCEL Divided Bed Filters are the result of continuous research, development and collaboration with the Pharmaceutical and Chemical industries. In addition EMCEL manufactures Triple Bed Carbon filters and a wide variety of other designs to suit customer requirements.